After the Port Stephens/Newcastle Season at the end of April the Iona & Iona II head north following the migrating blue marlin to the waters off the Gold Coast. The Gold Coast is no doubt Australia’s No 1 tourist destination with miles of beautiful surf beaches, lush green rainforest, world-class golfing greens and world-famous theme parks and not to forget the bluewater fishing! The fishing grounds off the Gold Coast consistently produce world class fishing, this tourist destination is also a premier destination for the avid blue water game & sport fisherman. Our Captains’ knowledge and experience of these fishing grounds have successfully made the Gold Coast a return destination for our clients each year. 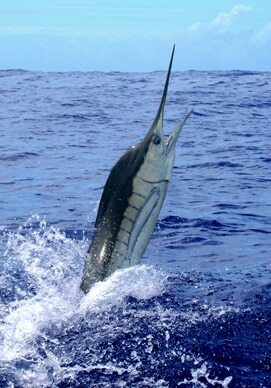 The waters offshore, of the Gold Coast consistently see black, blue and striped marlin each year. 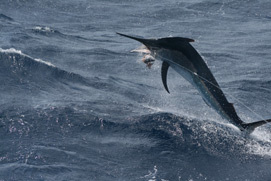 Blue marlin up to 700lb are increasingly finding their way to these waters. The Gold Coast waters also offer a diversity of pelagic fish Mahi Mahi (Dorado), Wahoo, Yellowfin Tuna, Amberjack and Kingfish. Much fun can be had on light, medium & heavy tackle with these sportfish. Along with game/sport fish there is also a large variety of bottom dwelling reef fish, species include Snapper, Pearl perch, Jewfish, Cobia, Mackerel and many more. These fish are beautiful eating fish and great to take home at the end of the days fishing. The Gold Coast is also a great destination for fly fishing & jigging. Our Captains and crew with their knowledge, experience and our highest quality of tackle and equipment, Iona & Iona II are the perfect platform for you Gold Coast fishing experience. 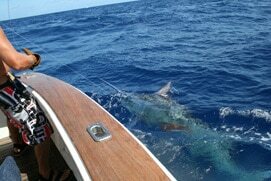 Exclusive day fishing charters can be arranged on Iona & Iona II out of the Gold Coast. Departure time is 0630 and return approximately 1630. The run out time to the fishing grounds varies from 30 minutes to 90 minutes depending on the fishery. Your day includes lunch, tea & coffee, soft drinks, bottled water, all bait and tackle and crew. Alcohol can be arranged on request. For rates and further information on the Port Stephens / Newcastle area please contact us.